Getting a PhD in science is an arduous feat; for some minority students, it can be especially challenging. The MagLab is working to give these students the tools and opportunities they need to see their journey through. Bridge Fellow Aidan Zabalo in the lab with the probe he built for his research project. Bridge Fellow Daniel Silva at work on a computer program about electrical grids. Graduate research assistants Shermane Benjamin (left) and Laurel Winter in the lab. Benjanin is a mentor for the Bridge Program. When people talk about becoming a scientist, they describe the process in almost epic terms. It is a pathway, a journey, a years-long odyssey leading to the prize of a PhD. The steep road is strewn with obstacles, even for the most fortunate. Minority students often face even more bumps — some so large they lose sight of the trail. Shermane Benjamin has negotiated his share of potholes, dating back to an underfunded elementary school where teachers made do with defaced textbooks — and sometimes none at all. He cleared all the hurdles and made it to graduate school at Florida State University, one of only three African Americans in a physics program of 130 students. When one of the three dropped out after a tough first semester, Benjamin was left questioning his own future. "Oh my God," Benjamin remembered thinking, "I'm going to be next. These numbers already don't look good for black people." Indeed. The percentage of minorities who earn doctorate degrees in STEM (science, technology, engineering and math) is distressingly low. According to the American Physical Society (APS), underrepresented minority groups comprised 28 percent of the nation's population in 2006, yet just 9 percent of college-educated Americans in science and engineering jobs (see graph in image gallery above). In Benjamin's field the numbers are especially bad: Fewer than 6 percent of doctoral degrees in physics were earned by underrepresented minorities (including African American, Hispanic American, and Native American students) between 2008 and 2010. According to the National Academy of Sciences, underrepresented minority students can face a variety of roadblocks, including inadequate education, financial limitations, outdated advising, lack of course availability and insufficient social support. As a result they may lack the confidence and motivation their fellow students seem to possess in spades. At times, it can seem a river of problems. The National MagLab is working to identify those roadblocks and — in keeping with the journey metaphor — to build bridges above them, dig tunnels below them or railroad right through them. Diversity takes many forms, and the MagLab is diverse in some ways: A virtual United Nations of Science, the lab has staff from some 50 countries. But like most science institutions, it has far less racial and gender diversity than it would like, said Diversity Committee Chairperson Roxanne Hughes. "In our everyday lives we are not segregated by gender, race or culture," said Hughes. "Diversity in our interactions increases the diversity of the ideas and solutions we encounter, which benefits us as a society. This should be the same in science." 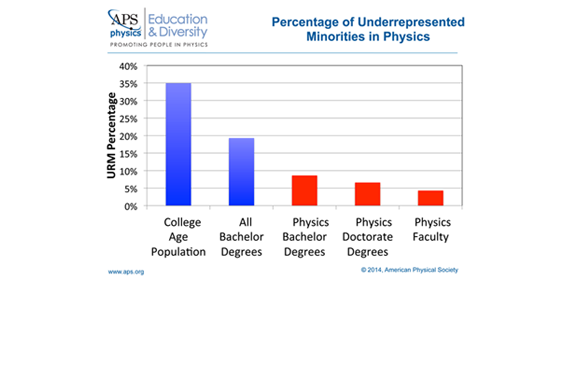 Working toward that goal, the MagLab runs a program under the auspices of the APS that aims to increase the number of physics PhDs awarded to underrepresented minorities — more on that in a minute. 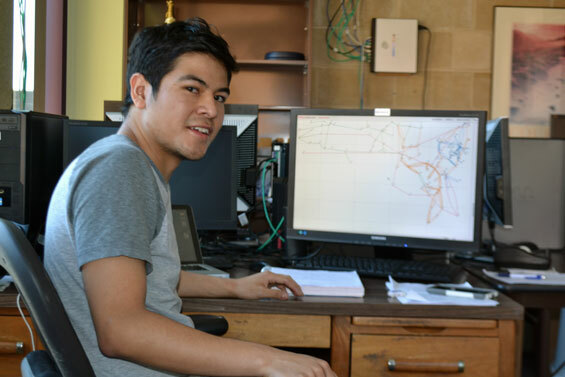 In addition, thanks to active recruitment, about half of students in the MagLab's long-standing Research Experiences for Undergraduates (REU) program are underrepresented minorities, said program director Jose Sanchez. 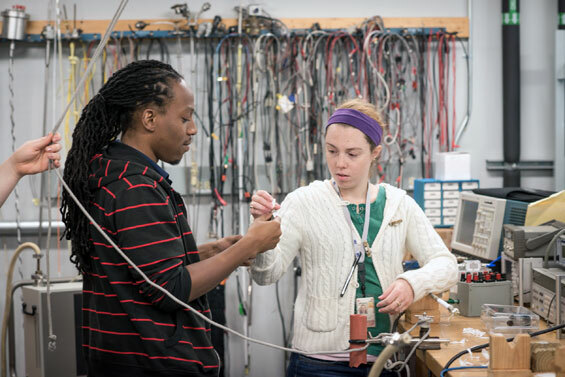 Research shows that REU programs, which give undergrads the chance to work on a summer research project with a scientist, help retain minorities in the STEM fields, said MagLab physicist Steve Hill, who serves on the lab's Diversity Committee. Cultivating diversity is a no-brainer, added Hill. "By not being inclusive," he said, "you're missing obvious talent." Benjamin, now five years into his PhD studies and a graduate research assistant at the MagLab, is a compact powerhouse who bounds down hallways. When intercepted, he talks at a caffeinated pace, often exploding into a laugh that is the real deal. Because words so poorly convey his enthusiasm, he often bolsters them with athletic gestures. His energy and humor have helped Benjamin weather rough patches in his education and early career: poorly funded schools, being raised in a low-income neighborhood by a single mom, and a paucity of role models. In fact, Benjamin was a college senior before he ever saw, face to face, a scientist who looked like him. The encounter, during a tour of NASA, stoked his science ambitions. "When I saw him, I was like … " Here Benjamin trails off, at a loss for a satisfactory adjective, and instead just sighs over the vivid memory. The sighting gave him a psychological boost just as he was preparing to apply for grad school. Now he wants his story and face to make the STEM path a little less bumpy for other minority students. "If I could be a part of that chain somehow, part of the chain of exposing people to science," Benjamin said, "that would be cool." In that spirit, Benjamin is a mentor in a program, now in its second year at the MagLab, which helps minority students earn PhD degrees in physics. 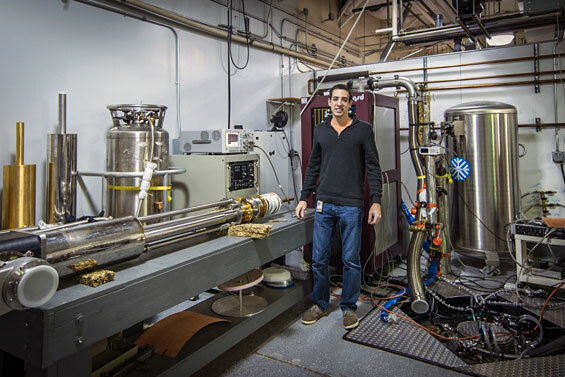 The Bridge Program, operated in partnership with the FSU Physics Department, offers mentorship and research opportunities to recent college grads who would otherwise be unable to start a PhD. Funded by the APS and the National Science Foundation, the program helps students recover from missteps that might otherwise have sidetracked their budding careers. Take Aidan Zabalo, a Miami native and son of Cuban immigrants who was first drawn to physics after earning a (for him) sub-par B in the subject in high school. "How can I not do well in physics?" Zabalo recalled thinking. "I need to learn this." He learned it, loved it, majored in it at Florida International University, and set his sights on a PhD. But Zabalo decided to take a year off before grad school to get more research experience and bone up for Graduate Record Examination (GRE) required for the applications. By the time Zabalo realized the delay was a mistake, it was too late: Without the test scores, no university would consider him. At about the same time, over on the west coast, another physics major had also just missed the boat to grad school. Unlike Zabalo, Daniel Silva had taken the GREs and applied to doctoral programs. Unfortunately, none accepted him. "It didn't feel good," recalled the laconic Silva, a graduate of California State University, Long Beach. It did feel good, however, when he was later admitted to FSU through the Bridge Program. Already the first in his family to graduate from college, he is now the first to pursue an advanced degree. The admissions team also selected Zabalo as a Bridge fellow: The technicality of missing test scores was overshadowed, the group decided, by the promise his application conveyed. When minority students stray off the beaten path to a PhD, they can be hard to find. Universities with a commitment to diversity need to spend time scouring areas along the path for the gems hiding behind a mediocre test score or GPA -- measurements that can belie a candidate's talent. 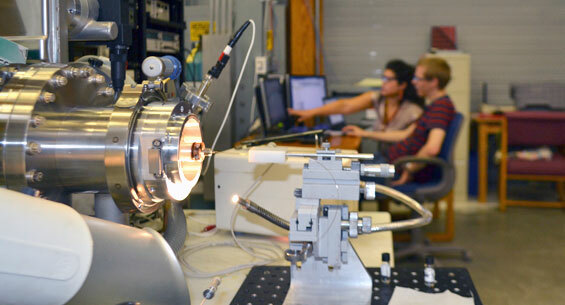 But the effort pays off, said FSU physics professor Simon Capstick. "You will leave behind students who have a strong aptitude for physics if you do what programs have traditionally done at the admissions level," said Capstick, who runs the FSU/MagLab Bridge Program. MagLab physicist Dragana Popovic, one of the researchers involved in the program, recently reviewed applications for this year’s two spots. To help fellows overcome past pitfalls, the Bridge Program lets first-year students take classes they ideally should have taken as undergrads but didn't. After playing catch-up that first year, the fellows are on an even playing field with their peers. "At that point they are indistinguishable from everybody else," said Capstick, "and some of the very best research students are students who have followed that path." When the science trail gets rocky, it helps to have a steady hand to guide you, a Sherpa to share the load. Throughout their education, minority students often face complex psychological territory, according to a report on expanding underrepresented minority participation in STEM by the National Academy of Sciences. In addition to dealing with racial stereotypes and low expectations from others, students can internalize those warped views and lose confidence. Even as a grad student Benjamin has had to face some of those monsters. Fortunately, he got encouragement and tough love when he most needed it. He will forever be grateful, he said, to the professor who summoned him to his office after his feeble first semester and told him, "Your future here is looking stark." Scary words — but Benjamin needed to hear them. "That was a big motivator, having people there to really push me," he said. Through the Bridge Program, Silva and Zabalo were paired with older students who helped guide their way. "They're seasoned veterans," said Zabalo. "They've gone through all the classes, they know what's hard, what stuff I can take if I want to be successful in it. I can talk to them for advice." Those must have been some pretty good tips: Zabalo earned straight A's last fall, as did Silva. Still, you need more than good grades to succeed in the sciences: You need to be a good researcher, too. The Bridge Program pays students a stipend to conduct research – an uncommon opportunity for first-year grad students, most of whom instead pay their dues as teaching assistants in lower level classes. Their research gives Bridge fellows an academic and psychological edge, plus a feel for what a career in their field is really like. "PhD degrees are primarily research degrees," said Ted Hodapp, Director of Education and Diversity for APS, which oversees the Bridge Programs at FSU and five other universities. "Getting [students] engaged in research as soon as possible gives them a leg-up on their careers." Studies show that exposing minority students to research helps keep them in the sciences and can motivate them to see tough coursework through, said physicist Hill. "Ultimately, it is all about research in the long term anyway, so early exposure is critical." Zabalo did research under the MagLab's Irinel Chiorescu, who assigned him the task of reconfiguring a sample holder (which scientists use to insert experiments into magnets) to include a cable for sending microwaves to the sample. "He's, like, ‘Go redesign this,'" remembered Zabalo, who needed to learn computer modeling and machining to get the job done. "This facility is amazing for research. You have anything you need … It's all on you to just actually go and do it." Chiorescu has watched Zabalo blossom as a scientist. "It was a little bit overwhelming at the beginning," the physicist said. "But finally he was growing, and I can see he is growing more and more confident day by day." Their MagLab research has already opened doors for Silva and Zabalo: Both presented posters on their projects, and Silva presented a paper he co-wrote at an out-of-state conference. The opportunities gave the young scientists a chance to hone networking and communication skills and to further build confidence — all tools that will serve them well on the long road ahead that will surely lead, at this promising rate, to their doctorates in physics. Photos by Dave Barfield and Kristen Coyne.